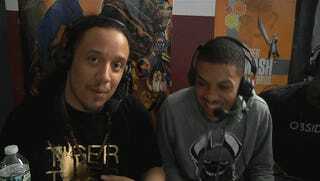 After a few weeks away, Dominique “SonicFox” McLean returned to New York City’s weekly Next Level Battle Circuit tournament series Wednesday night for a bit of Dragon Ball FighterZ competition. The king of fighting games had taken a few recent losses to rival Goichi “GO1" Kishida, and was ready to throw down with a new team—and perhaps block access to a tournament slot along the way. The Next Level Battle Circuit in Brooklyn acted as a qualifier for Summit of Power, a special Dragon Ball FighterZ competition to be hosted by esports outfit Beyond the Summit in June. The winner would be invited to join the event alongside SonicFox, GO1, and six other summoned players for a weekend of Dragon Ball festivities with $10,000 up for grabs. So last night’s NLBC bracket was stacked with talent, all vying to earn the coveted invite. 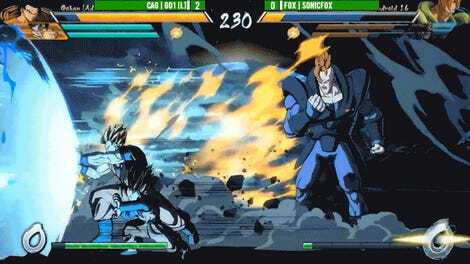 Because he already had the bye into Summit of Power, SonicFox didn’t have to attend Next Level Battle Circuit. Instead, he was playing to regain the throne he had abdicated to New Jersey competitor Eduard “HookGangGod” Deno, who managed to rack up a four-week streak of victories in SonicFox’s absence. Since falling to GO1 in two separate exhibitions, SonicFox had returned to the lab, constructing a brand new team for serious Dragon Ball FighterZ play. Gone were Goku Black, Hit, and Android 16—the powerhouse trio he dominated with for months—in favor of Cell, Gotenks, and Kid Buu. It’s easy to see why: in Dragon Ball, the ability to confuse the opponent is just as important as pure power, and these new characters have the tools to maintain pressure in ways the previous group lacked. SonicFox first proved the potency of his new team by defeating Northern California visitor Vineeth “Apologyman” Meka in exhibition and then winning the entire tournament at Bum’s Birthday Bash two weeks ago. SonicFox shredded through the bracket with his signature hot streaks and overwhelming offense, and with the night almost over, the only obstacle left in his way was the man he came there to beat. Despite his use of an unorthodox team comprised of Piccolo, Goku Black, and Vegeta, HookGangGod had dominated in Brooklyn while SonicFox was away. While he made more of a dent in SonicFox’s armor than previous opponents, HookGangGod also proved unable to completely stop the new Cell powerhouse. When all was said and done, SonicFox had regained his crown, dropping only one game to HookGangGod over the course of winners and grand finals. It always hurts to lose a tournament, especially after a long winning streak, but the silver lining for HookGangGod was that the Summit of Power qualifying position was passed down to the second-place finisher. He’ll be traveling to Beyond the Summit’s Los Angeles headquarters this summer, hopefully with a bit more experience and ready to throw down with some of the best Dragon Ball FighterZ players in the world.